New Girl Fans, this post is for you! I am such a fan of this tv show and as my followers know, Winston is my favorite character. 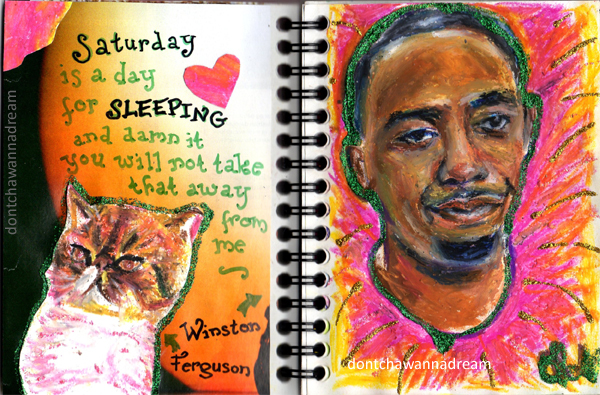 I already made two paintings of him, check them out : Winston & Ferguson and Princeton Bishop. I really had fun making these drawings. Lately I’ve been obsessed with filling my sketchbook with cool projects. What I’ve learned over these past 3 years (my blog will turn 4 in September 2015)… you can have A LOT of fun with small projects that really help you be more creative. I started to have a sketchbook only recently and I can see the difference. Also, I notice that you may spend many hours on one painting, do it with all your heart and energy, it doesn’t mean people will like it more than a quick sketch. It could be frustrating but actually it just means that you just have to share your work no matter what… People’s comments could surprise you. Everything is interesting and worth seeing. Oh sleeping, always a treat. Definitely worth a beautiful drawing. Your quick sketches are really quite amazing. Much better than most of us could do if we spent hours or days on it.